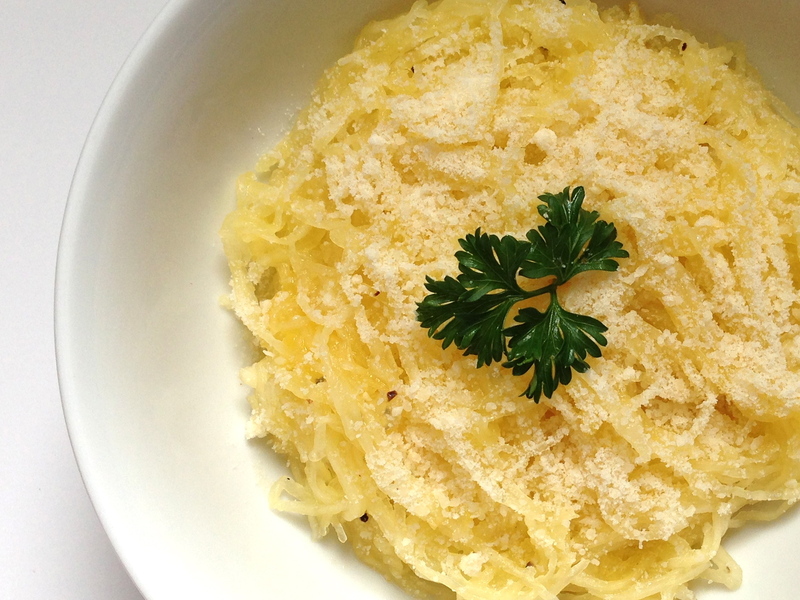 I love spaghetti squash, but I don’t like the task of cutting uncooked squash in half. By boiling it in a stock pot, it is so much easier to cut in half and you can eliminate the oil needed for roasting. This recipe is so simple and tasty! Place squash in a stock pot and cover with water. Bring water to boil over high heat. Then simmer on low heat for about 30-35 minutes. Cook until you can pierce squash easily with fork. Cooking time will vary depending on the size of the squash. When squash is done, drain and set aside, until is cool enough to handle. When cool, cut it in half and discard the seeds. Using a fork gently scrape, carefully separating the strands. In microwave, melt butter. Combine butter and olive oil together. You can use all olive oil if you prefer, I just like the slight taste of butter. Drizzle over squash and stir. Add salt and pepper to taste. Sprinkle with cheese. Serves 6.